NEEL has created a new aesthetic in naval architecture. 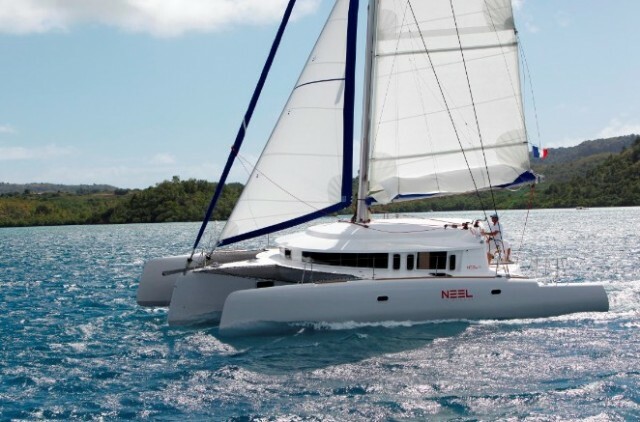 The NEEL innovation is the integration of the two outriggers with the connecting platform into a unified living spacewhich includes the bridge, a central galley, and a magnificent panoramic lounge. The proportions of the trimaran offer a generous roof area, guaranteeing internal volume. To optimise the structure of NEEL trimarans, we collaborated with TENSYL with whom we have previously worked on the structure of the racing trimaran TRILOGIC. TENSYL has made a speciality of the structural design of multi hull racing and cruising composites. Sampling is determined from the most critical cases of offshore loading on the structure, for example catching a wave at high-speed or sailing with the wind on the beam. The analysis programs transmit relevant information which are compared to nominal values in the specs. Colour displays are particularly instructive in sample determination. The overall research programme aims to define type and quantity of construction materials best suited to each zone in order to eliminate unnecessary weight and apply suitable safety margins to load bearing elements. Hull, floats, bridges and roof are made in vacuum bonded PVC/foam and glass fibre/ isophthalic polyester resin sandwich structural material. The boards are fabricated from honeycomb PVC vacuum bonded with glass fibre/isophthalic polyester resinstructural material. 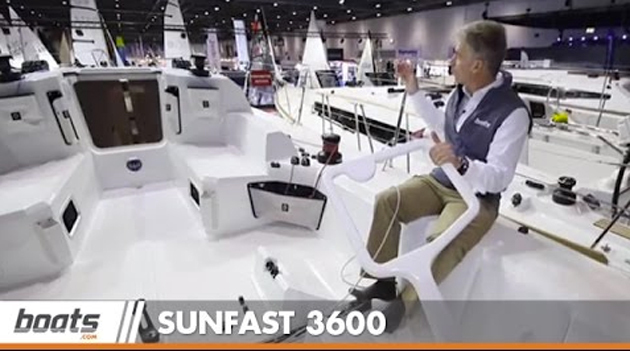 Resin is infused through Fibreglass according to a sampling plan determined by finite element structural analysis gained from our experience in the construction of racing craft and offshore cruising. Depending on their role in the structure of the trimaran, the type and number of glass fibers are either unidirectional, bidirectional, 0 ° / 90 ° or bi-directional 45 ° / 45 °, Quadri-directional, TAFTA, roving or twill. Rigging and sails are designed and produced by multi hull specialists in La Rochelle. Interior coverings (linings, floor, upholstery) have all been tested rigorously in oceanic conditions before being selected for your NEEL trimaran. On a catamaran the maximum righting moment occurs at 12° heeling, as shown on the stability curve. 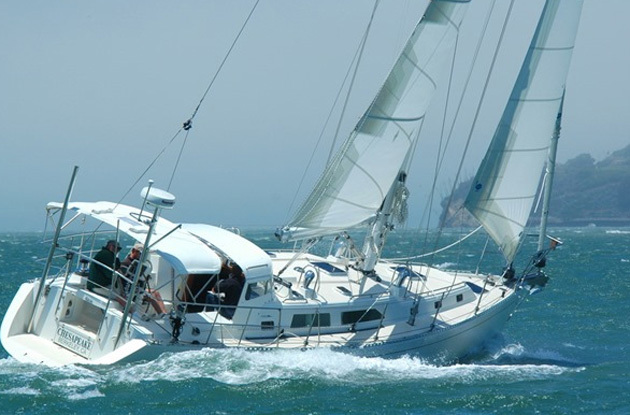 This angle can be reached relatively easily when sailing in strong winds and heavy seas. therefore in normal multihull conditions of use, this angle is never reached. For this reason, and thanks to the centered weight distribution, a trimaran is much more stable than a catamaran. The PVC foam sandwich construction and collision bulkheads guarantee that the craft is unsinkable. The fin of the central hull protects the engine block and rudder gear. The shallow draft allows you to navigate close to the shore and enjoy the most beautiful anchorages. The high average speed optimises navigation planning, according to weather conditions. The fractional rig (mainsail, solent, staysail) facilitates short-handed operation, notably for duo crews. 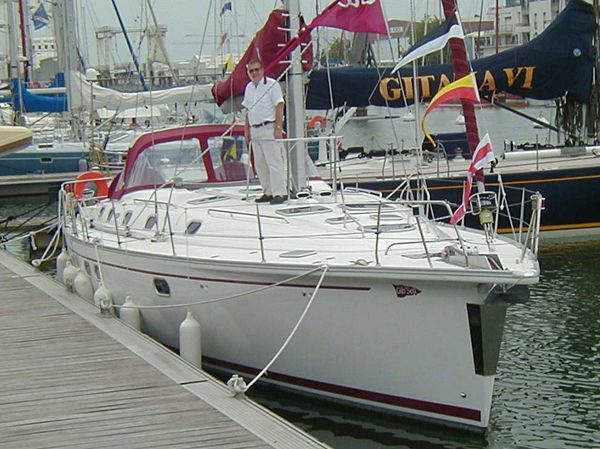 All embedded systems, such as refrigeration, electrical and electronic installations, energy generation and storage, fittings and rigging all benefit from our twenty seven years of experience in boat building. 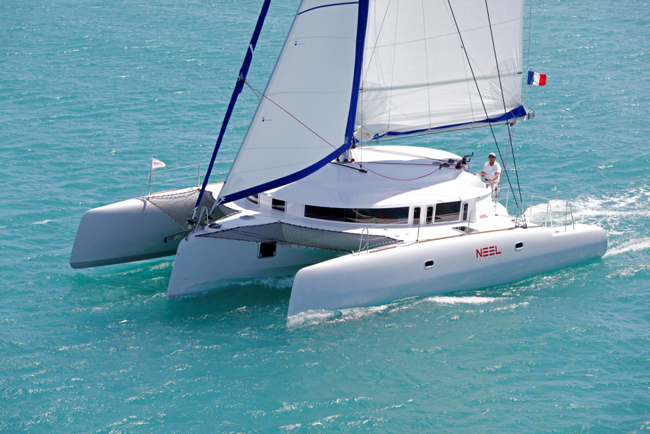 NEEL trimarans are certified according to CE European standards by the French Institute for Nautical Certification and Standardisation (ICCN). Let’s consider both the trimaran and the catamaran heeling by 12°, which is the safety angle not to be exceeded on a catamaran. As shown in the graphics, the Righting moment (GZ) is much higher on the catamaran than on the trimaran. A high GZ means more brutal and uncomfortable seakeeping. At this angle of heel the catamaran’s GZ is double that of the trimaran. Therefore, sailing the trimaran is much smoother than sailing the catamaran. The trimaran has less roll motion than the catamaran, as the center of buoyancy is never far downwind like on a catamaran. Again, centered weight is the key to success and comfort. 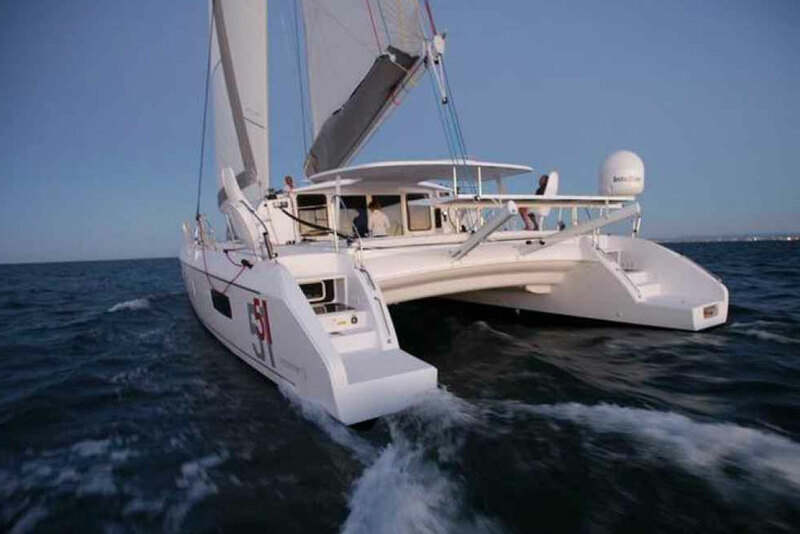 In fact, all significant heavy equipment is located in the main central hull on a trimaran whereas it is distributed half and half in each hull on a catamaran. NEEL trimarans are manufactured with materials and techniques best suited to their use, combining strength, rigidity and weight reduction.